Not to be confused with Rolling Down the River. 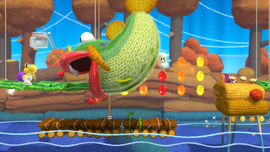 Rollin' Down the River is the third level of World 4 in Yoshi's Woolly World. The level is set in an environment resembling an autumnal forest. Yoshi has to trek along a river littered with Lunge Fish. The level begins with a platform with a Lunge Fish below it. Several Woozy Guys follow, along with a paddle wheel and a few platform outlines, along with more Lunge Fish. After another group of Woozy Guys, more paddle wheels follow, along with more Lunge Fish. The first checkpoint immediately follows, along with a Whirly Gate leading to a Mermaid Yoshi segment. This leads to the second checkpoint, which in turn leads Yoshi to a raft. The raft will cross several leaping Cheep Cheeps and a few Ukikis, as well as a few Piranha Plants. Afterwards, several more Lunge Fish and Woozy Guys will appear, along with a waterfall. Several Ukikis appear, as well as a few more Piranha Plants and Lunge Fish. Not too long after, the second waterfall appears, and the raft begins to break off to the point where only the part of the raft with the flag remains. After yet another Lunge Fish, the raft will approach one final waterfall leading directly to the goal roulette. Smiley Flower 1: Inside a Present Box outline, just after the first paddle wheel. Smiley Flower 2: Unveiled after hitting a hidden Winged Cloud at the third paddle wheel. Smiley Flower 3: In a Winged Cloud in a gap in between the second and third Piranha Plants. Smiley Flower 4: Immediately after collecting the third Wonder Wool, Yoshi must ride the raft and duck under a ledge to collect the Smiley Flower. Smiley Flower 5: Just before the final waterfall, in plain sight. Yoshi must throw a yarn ball at it in order to avoid touching the Lunge Fish. Wonder Wool 1: Up above, just by the first group of Woozy Guys. Yoshi must either jump on a Woozy Guy or throw a yarn ball at the Wonder Wool to collect it. Wonder Wool 2: Near the end of the Mermaid Yoshi segment. To get it, Yoshi must make a high jump. Wonder Wool 3: When encountering the first Lunge Fish after the second checkpoint, Yoshi must touch the exclamation circle, which will reveal the Wonder Wool over to the right. Yoshi must grab it before it disappears. Wonder Wool 4: Unveiled after hitting the Winged Cloud after the first waterfall. Wonder Wool 5: Unveiled after hitting a hidden Winged Cloud behind the final waterfall. 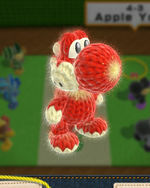 Collecting all of the Wonder Wools knits Apple Yoshi back together. Between the first and second checkpoints, there is a Mermaid Yoshi segment that, when completed, cannot be reentered. This stage's name is a reference to the Creedence Clearwater Revival song "Proud Mary," which is sometimes erroneously called by its repeated chorus lyrics, "Rollin' On the River." This page was last edited on October 29, 2018, at 10:33.